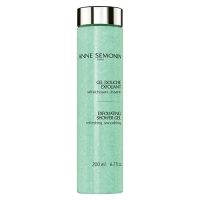 A gentle wood pulp body exfoliator ideal for all skin types, especially those suffering with mild dryness. The silky gel texture of Exfoliating Shower Gel works to regenerate the epidermis whilst releasing the invigorating fresh scent of green tea and jasmine. Created with a softening formula, the gel delivers a rejuvenated texture to the skin's surface whilst giving a refreshing boost to the senses. Vitamin E - Offers hydrating antioxidant effects.